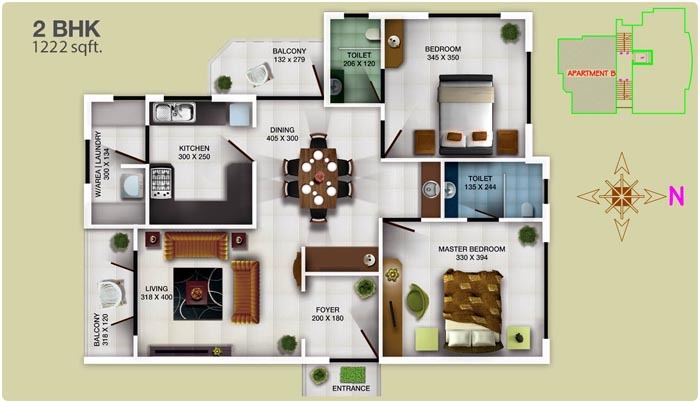 READY TO OCCUPY FLATS/ PALAKKAD/ 2BHK/ 3BHK/ SALE@Town/ REQUIRED?WANT? Earth quake resistant RCC framed structure with foundation as per requirement. Walls with Redbrick/Block Masonry. Spacious rooms with excellent cross ventilation and natural lighting from all three sides. Foyer, separate living and dining area. Independent balconies opening from living and bedrooms to provide maximum view on background Blue Mountains. Also no common wall sharing. 2x2 vitrified tiles for the apartment except bathrooms/balcony. Vitrified/granite tiles for lobby and common area. Three phase power supply with concealed conduit wiring with high quality copper conductor. Adequate light and fan points with elegant Modular Switches. 6/16A plug points controlled by ELCB and MCBs with Independent Energy Meter. AC provision in Master Bedroom. Putty with premium emulsion finish for internal walls and ceiling. External walls will be furnished with weather shield. Designed veneered matt finish entrance door. Hardwood frames with MDF paneling for internal doors. UPVC frame work with glass for windows & French windows. Polished granite top having stainless steel sink with drain board. 2 FT dado with ceramic tiles above the counter. Provision for exhaust fan and water purifier. Washing machine provision at work area. Anti skid ceramic tiles for floors and matching wall tiles up to 7 Feet height. Good quality concealed pipes and CP fittings. Hot & Cold taps with overhead shower and piping for geyser in main toilets. Wash basin & EWC in toilets. Provision for exhaust fan in toilets. For lift, common lights, water pumps and for all points in each apartments subject to a maximum of 500W. Modern fire fighting arrangements as per Kerala building rules and fire force requirements. Water Supply from KWA, and bore well through sump and overhead tank to ensure continuous supply. Concealed cable TV points in living room and master bed room. Concealed conduit wiring for telephone in living and master bedroom. One LAN point in living room, video door phone/intercom in living/dining space. Covered car park at extra cost. Allotment on priority basis of booking. Besides 24hrs personnel security, access control system will be provided which would facilitate total security which includes video door phones to identify visitors.